Now you can come see, feel, and rest where Decades of research, development, and the successful creation of many examples of what can be created out of salvage in an Artistic fashion, that also works great as an Organic hOMe. The time has come to share, teach others how to gather the incredible resources for no more than human energy, and add ingenuity, imagination, and soon create a home that will last a lifetime or two. Please join us as we grow from building houses from 95% Pure Salvage to creating an example of how entire communities could be built with this Ethos that respects our ancestors, our planet, and provides solutions for millions who face housing needs now and in the near future. As the weather changes, Babyboomers bail on the American Dream, and the new generation picks a different set of values to judge their success by rather than consumerism. To learn more about the ways we are going to be funding future growth, please check in and get on the newsletter list. as well as, if there are any houses coming up available, a possible one to own for you one day too. go here. 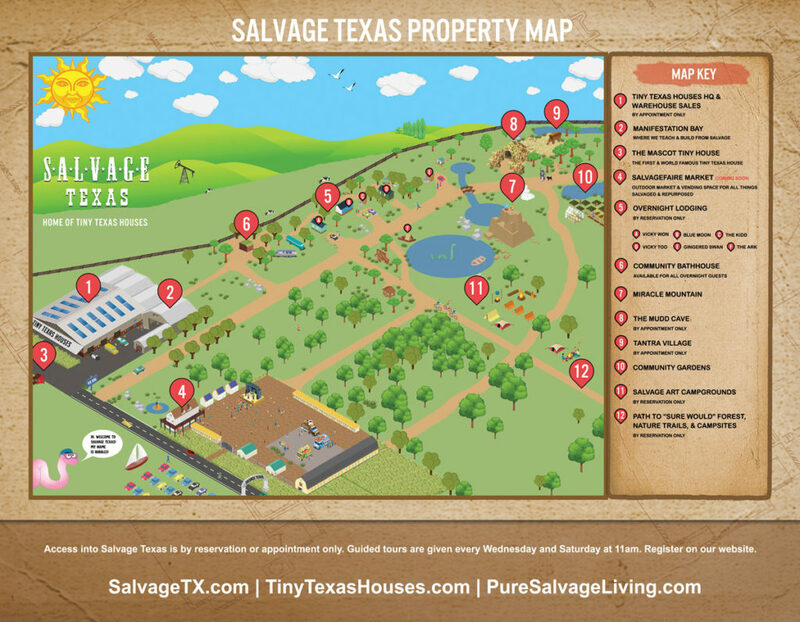 Visit Salvage Texas 7 days a week by reserving an overnight retreat in our Tiny House Village or Salvage Art Campgrounds. Want to experience Tiny House Living in a variety of sizes, from 69 sf, 80 sf, or up to a couple hundred square feet? How about in an Ark of Salvage? 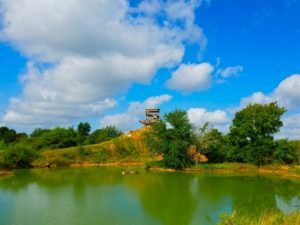 Better still, high up on a hill, in fact perhaps soon, atop Miracle Mountain Cottage that can sail into the clouds at night with you along for the Peter Pan dreams few will experience in life. 2. Become a Salvage Texas Patreon! We are now giving you the opportunity to support the world-changing things we are doing on Patreon! Supporting freedom is just a click away. Soon you will be able to own a bit of Salvage, Texas Air Space, all the way to the moon when it fly’s over us at night. From up in Miracle Cottage you will be able to see the AirSpace you own, or a hOMe that others get to share, or much more if you want to get involved financially. The most important element of this page is the blogs which keep you up to date on what is going on at Salvage, Texas. Picture galleries like none to be found showing all the houses and things that come from imagination and salvage combined with human energy. Please join me in the Pure Salvage Living Renaissance, the foundation for the creation of Tiny Texas Houses and the Organic Cottage Line that will follow as we focus on developing out Salvage, Texas as a model that will attract millions seeking answers, knowledge, life skills, and examples of what we can do with our imagination and the resources gifted to us by our elders created when they were kids. Please join me in my Poetry, my rants on toxic houses, and the path to bring Awakening to the gifts we have on hand and what we can do to harvest, share, and create the solutions that will change the world. This is about Paradigm shifting at a level that the masses can benefit from greatly, in a short amount of time if we can just share, communicate, educate, and then celebrate the prosperity it can unleash upon the millions of small businesses that could be successfully operated in this sustainable home building industry. The demand for Tiny Organic Cottages has never been seen before, but the demand is growing incredibly fast in a time when we have the means to make it possible without importing much, cutting down trees, or creating massive building waste from toxic new products. Historically, more millionaires are made out of the salvage businesses from scratch than any other in our country. If you want success and the path that does good for others to find it, please join me as I attempt to lead others to the Salvation I have found through Salvage and the path it can give you to your dreams coming true too. Salvage Texas hosts guided tours of the venue, tiny house village, and workshop, the warehouses where you can buy items after the tour (normally not open to the public) on Wednesdays & Saturdays each month but you must call ahead to be sure there is space or that the whole place has not been rented out for an event, No Tan Line weekend, or just rained out. Join us for an unmatchable look at the vision and philosophy surrounding our property and meet the visionary behind it all, Brad “Darby” Kittel, if he is able to appear for a short lecture or discussion. Larger groups may entice him, but generally, he is out in the back areas creating instead of talking whenever possible. It is what Wii Do, not what we say that makes things happen, change for the better, and give Hope to others that they too can do what it takes to find their version of Success and Happiness in their life through Salvage. We are still considering a few more applications for interns and residents to work and study with our on-site carpenters and team, as well as permaculture people to come and help establish the foundation for our food jungle now that the waterways of Endless Creek are nearly finished. Both above and below ground, much to do for the talented like you at Salvage Texas for the 2018 -2019 seasons. There are a number of different projects underway at Salvage Texas that we need help building out and numerous ways to get involved. At the moment there are No Paid internships beyond a percentage of what you can create, sell, and reap a percentage from as the creator of your Salvage Houses, Salvage Art, or other work that makes this vision of Salvage, Texas more than just a cyberspace entity. Soon it will be a place where millions of minds will be launched into a new Enlightenment that will let them see the world in a way that Salvaging lives, homes, and families are paramount to all other goals in life. You can learn more about our internship program and apply by going here. We’re on social media – so feel free follow us, direct message or give us a good ole’ thumbs up! Share photos from your experience by using #salvagetx and stay in the loop for any upcoming events by subscribing to our newsletter below!